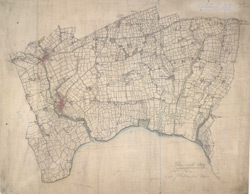 This plan of the north side of the Thames shows Barking and Ilford to the left, on the banks of the Roding, and Rainhham and Hornchurch to the right. A patchwork of field boundaries dominate the landscape, with open dotting depicting unproductive enclosed land. Pencil lines intersect across the plan, recording the angular measurements taken by the surveyor to calculate the distances between fixed points in the landscape.